Sometimes after a P2V conversion or after recreating a VM and re-attaching the original hard drive, the drivers for the old physical NIC are still present and the physical NIC is still considered by Windows as a device on the machine. The problem with that is that the original NIC will be ‘hidden’ somewhere in the system configuration and you'll be unable to assign the IP address to the new NIC because it is still bound to the old NIC. 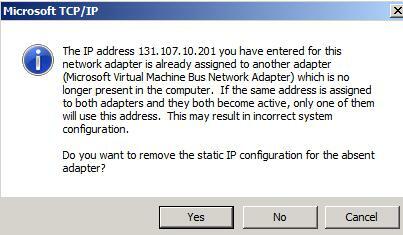 "The IP address x.x.x.x you have entered for this network adapter is already assigned to another adapter." If you look in the list of devices in Device Manager you will notice that your new NIC is now listed as “Microsoft Virtual Machine Bus Network Adapter #2” and that no other NICs are apparently present in your system. So where is NIC #1? Well, it's still there but it is hidden and as long as Windows remembers about it you will not be able to assign the new NIC its correct IP address. 1.Click Start > Programs > Accessories > Command Prompt. Make sure you type devmgmt.msc in the same Command Prompt where you typed "set devmgr_show_nonpresent_devices=1". This is because the "Set" command is only effective in the environment of the Command Prompt you opened and its setting will be cleared when you close it. 4.Now in Device Manager click View > Show hidden devices. 5.Expand Network adapters. The old physical network cards are now visible and grayed out. 6.Right-click on these NICs and click Uninstall. At this point you can assign the IP address to the new virtual NIC. A reboot will be needed for the registry key to be applied. I am sure that doing this via GPO will save you a lot of time, because old hidden NICs are a common and recurring problem in Windows environments and being able to uninstall them without going through a too long procedure is a major improvement to me. Good advice, with clear steps on how to do this - it is a simple process but is easy to overlook. Thanks for commenting, Sam. Yes, it was not a difficult problem to solve. Nonetheless I have encountered this kind of issue too many times at my customers. That is way I have come to think that using a GPO is really the best thing you could do anytime you are P2Ving some servers. I've ran into this problem too and I'm very glad I've found this DEVMGR_SHOW_NONPRESENT_DEVICES variable info, it made my day! The problem is that the issue was recurrent on all of the 40 systems we've converted and when we got into the "device Manager" window realize that there were a lot of "ghost" devices and in some cases removing all of them took us about 20 minutes per system. So after a quick search Google sent me to this very useful link (https://github.com/kevinoid/remove-nonpresent-devices) a script that a really nice guy shared to remove all of the ghost devices in one step, unfortunately it requires the devcon.exe program from Microsoft (which you can get from here: http://download.microsoft.com/download/1/1/f/11f7dd10-272d-4cd2-896f-9ce67f3e0240/devcon.exe) I went a little further and made a really small *iso file with the script and the Microsoft program needed, went for the iso choice because as you may have already noticed, the problem that led you here is that you can't enable IP comms with the same IP address that you've got before (in my case, to get an additional IP address from the network guys was an issue). Anyway I'm sharing the iso file with all of you and I hope it will help you. Feel free to share it and test it. Here you can find the *iso (http://dl.dropbox.com/u/391635/remove-devs.iso its about 144K). This might come "a little overdue" ;) but I'm glad the iso was useful for you. Is this ISO .js working with Win server 2008 R2? This is blue gold! 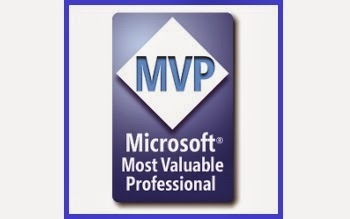 Thank you very much...worked perfectly with Windows Server 2012 R2.